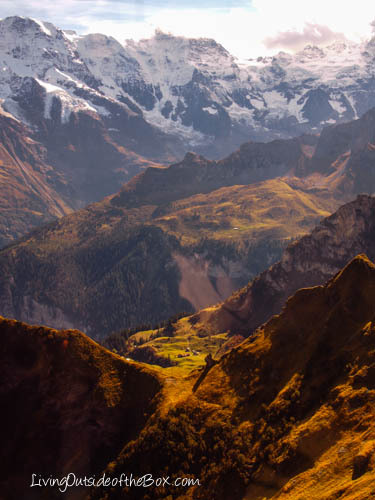 What trip to Switzerland would be complete without embarking on a summit in the Bernese Alps? 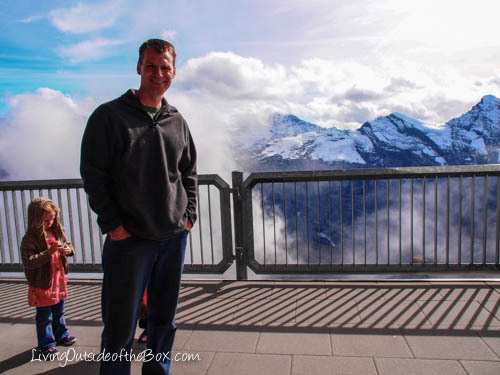 Since we weren’t up for the 5+ hour hike, we did it the easy way–albeit, the much more expensive way. After paying a hefty $187 fee (which was at a huge student discount, thanks to the sympathetic sales clerk who offered it to our family! 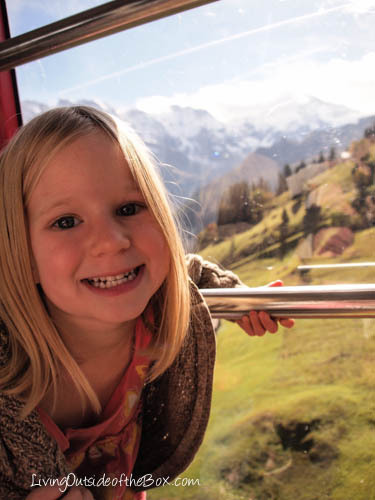 ), we jumped on a cable car transit system that began in Stechelberg. 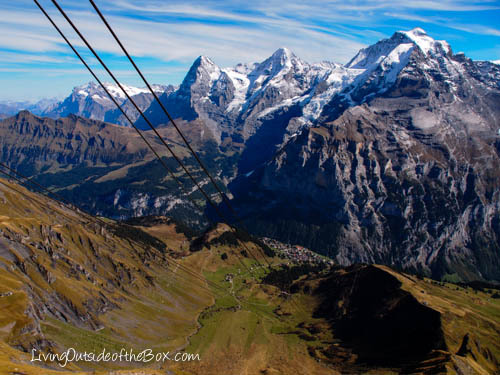 The cable system consisted of 4 legs–first from Stechelberg to Gimmelwald, Gimmelwald to Mürren, Mürren to Birg, and then from Birg to the very top. 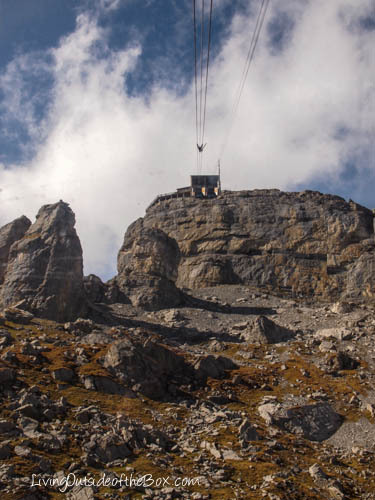 Each stop required us to exit our cable car and load into a different one going up a different section of the mountainside. It took just over 30 minutes to reach the summit, but since we were getting on and off cars, we didn’t get a chance to relax that entire time. 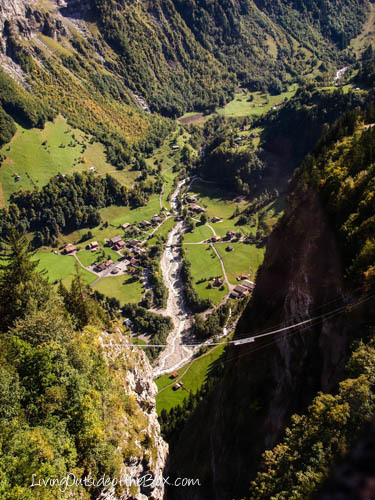 This cable airway is the longest and most technically challenging in the world! 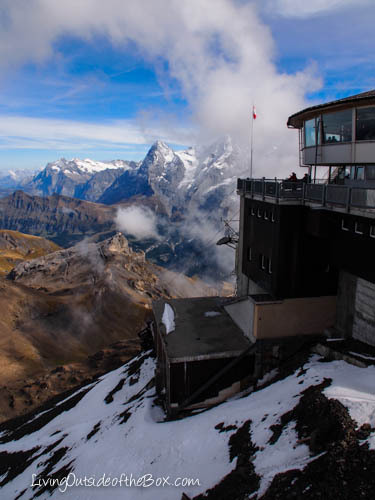 It was constructed in the 1960’s and its prize feature is a panoramic revolving restaurant on the summit. The restaurant was made famous when they filmed a portion of the 1969 James Bond movie, “On Her Majesty’s Secret Service” there. We did not go in the restaurant, but walked all around it on the viewing platforms. 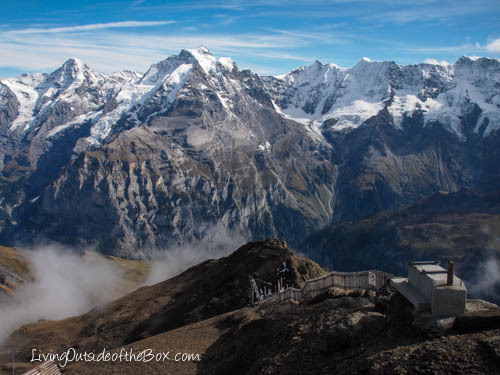 As a note—it takes 55 minutes for the restaurant to revolve 360 degrees, and has views of over 200 other summits (including Eiger, Monch, and Jungfrau—an UNESCO World Heritage site). 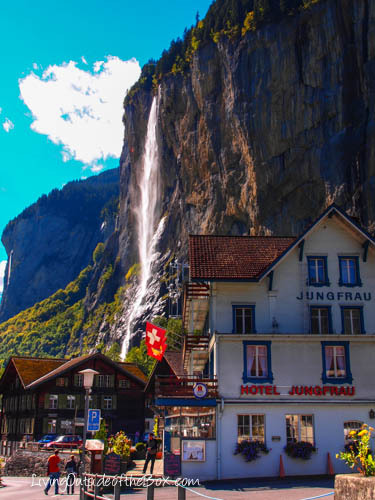 We first drove into Stechelberg, which had a stunning waterfall gushing over the side of a cliff near town. 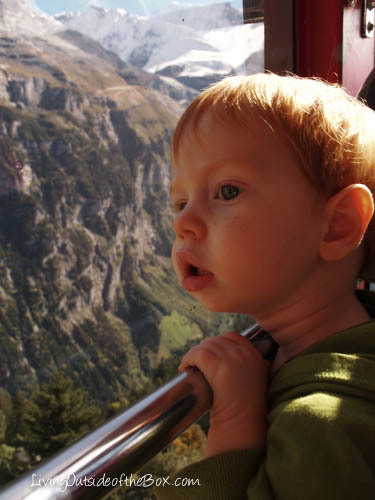 We kept driving into the valley to get to the start of the cable cars. Apparently the wind is just right for paragliding! At the ticket station there was a map of the climb. 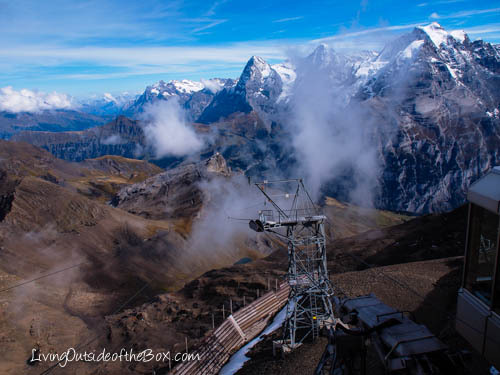 The first cable car station is the bottom left, then you jog up to the left, then to the middle-ish, then straight up at a huge incline to the 2nd ridge, and then to the top! 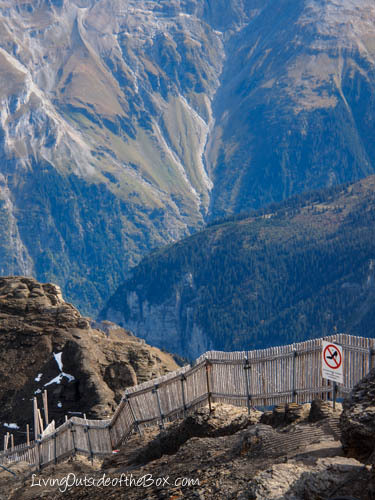 Would you dare to take this footbridge? The kids were entranced, particularly 2 year old Ethan. 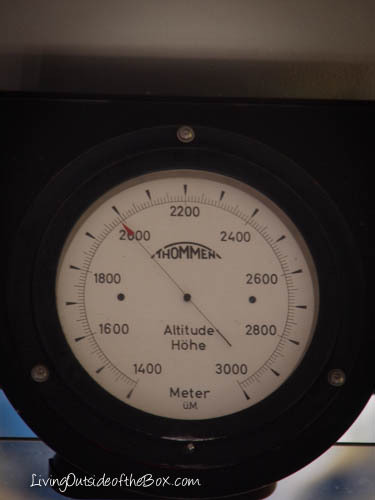 An altitude meter in each cable car helped us watch our climb. 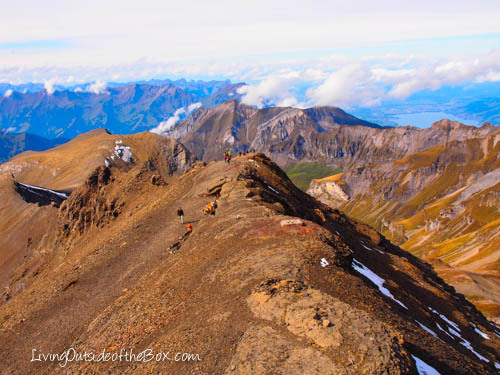 This is the very last climb from Birg to the Summit–we were well above the tree line! Looking back down….can you see the village where we started below? What boggles my mind is that this sign was made for a reason. Was it really such an issue?! After spending a little time on the top (it was chilly!) 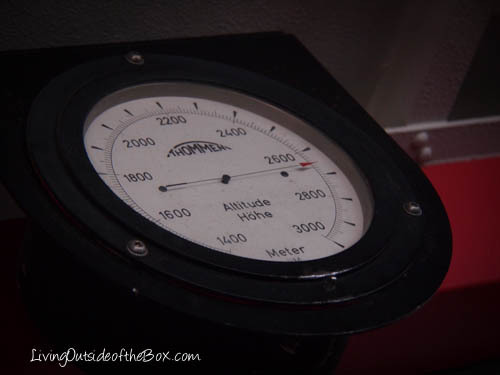 we began our descent. 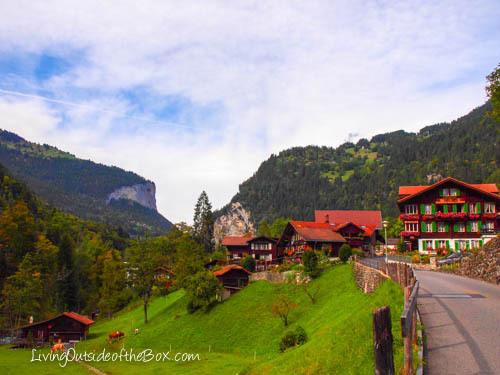 We took a brief stop/walk in Mürren, a cute little mountainside village that is at 5400 ft elevation (1650 meters), and inaccessible by public road. Low and behold, some Americans stopped and took our photo for us! They mentioned they had seen our family earlier, and had been admiring my headband. They asked where they could get one (Guatemala). Ha! 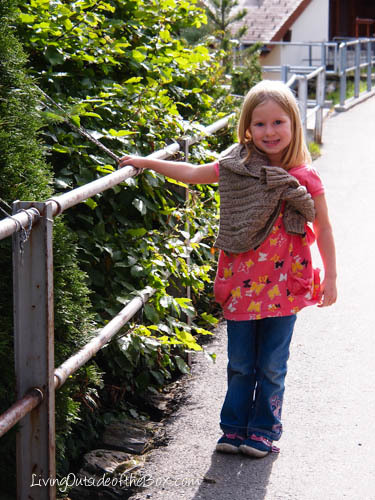 Despite the high cost, we’re very glad we did this short little jaunt up the mountains with our kids. It was totally worth it! 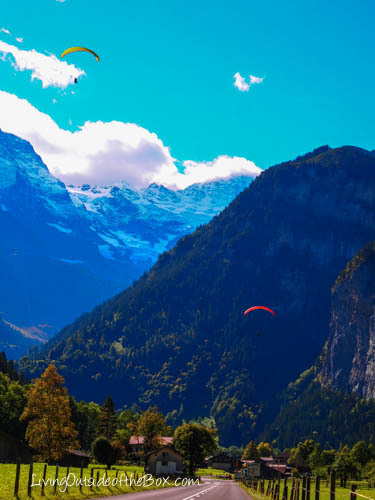 Switzerland clears my head, mind and soul. What an amazing view and you had such a perfect day. God’s creations always amaze! Agreed! 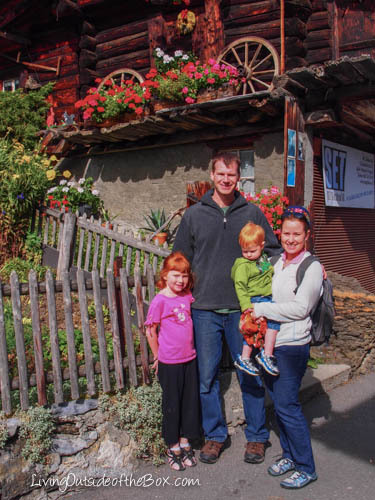 Sometimes I wonder how in the world all of my Swiss ancestors could have left there! They were from nearby, and I bet they missed those mountains when they moved to Northeast America! I want to do that!!!! I’ve been up there! Thanks for the reminder,I was about 13 years old, a school trip. I remember very little about it, other than snow. I hope we all got a massive school discount or I’m afraid my mother totally wasted her money, as a school group, all we were interested in was boys and discos. I would think the hike is far more than 5 hours. 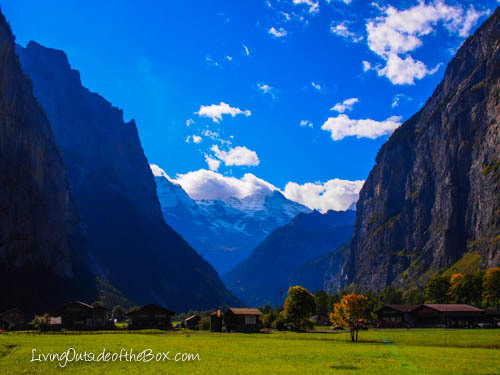 I walked the STUNNING flat trail from Lauterbrunnen to Stechelberg, and then took the cable car to Gimmelwald. 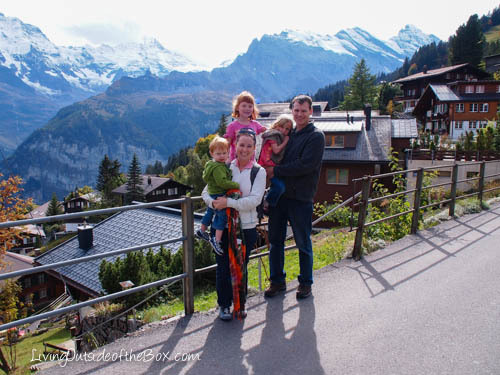 rachel, I HIGHLY recommend the walk from Lauterbrunnen to Stechelberg, even with kids. It’s flat walk and stunning and not that long. 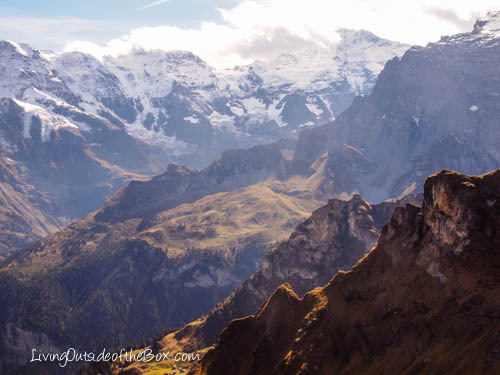 After I got to Gimmelwald, I then Hiked to Murren, and then on a maybe 7 kilometers past Murren, maybe less. That hike also wasn’t terrible, and partially in the woods. I think I met only one hiker on that part of the trail. 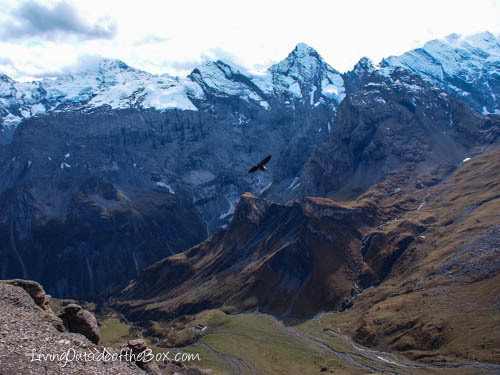 Then I hiked all the way back to Stechelberg via Murren and Gimmelwald, which was pretty steep. And that was a full days hike. 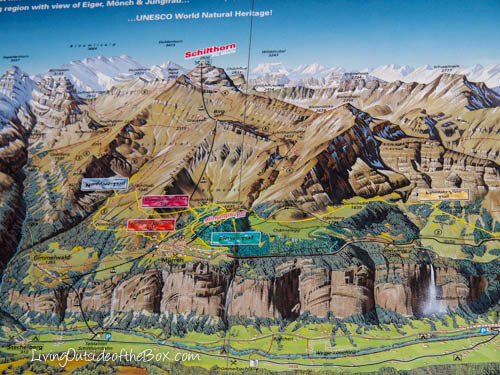 So I can’t imagine hiking from Stechelberg to the top in one day. But YOU have made me want to go back and make it to the top somehow. I don’t go to mountain peaks nearly enough. 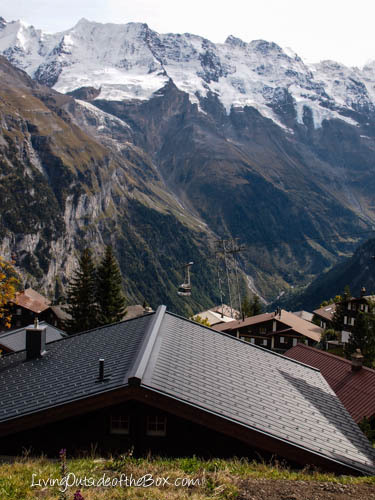 I don’t know if you guys have noticed this, but as a whole, I found Switzerland more enchanting that the Rockies in Alberta and the lower 48 states. It feels less touristy and torn up than our national parks, at least to me. Edit: Flip that. 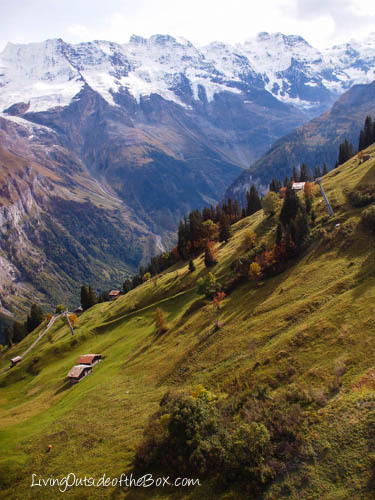 I think took the cable car to Murren, then hiked another 7 kilometers, and then went back down through Gimmelwald. Something like this anyways. I want to go back. Thanks for the lovely post. I would think you are right! 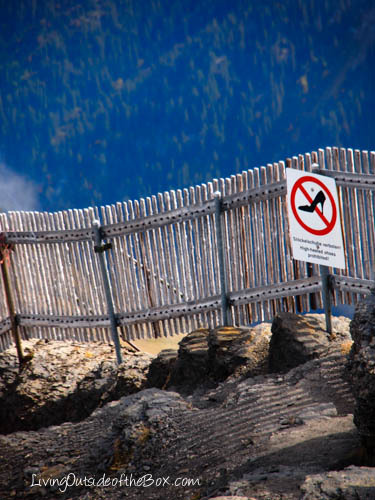 I don’t know how anyone could hike that incline in 5 hours…but hey…what do I know? I simply looked it up online, and that’s what it said!! 🙂 That’s great you have done it, and I hope you DO make it back again! 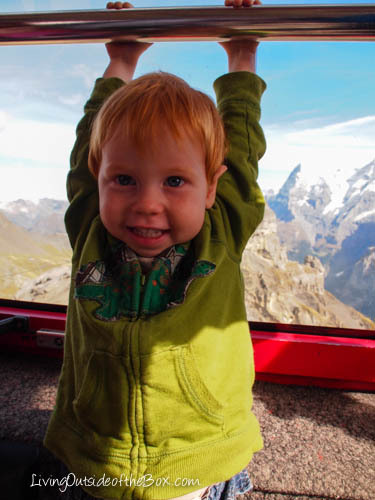 I agree about Switzerland…it is STUNNING and unaltered, it seems (okay–despite cable cars and chair lifts…haha!). It reminds me of Alaska! 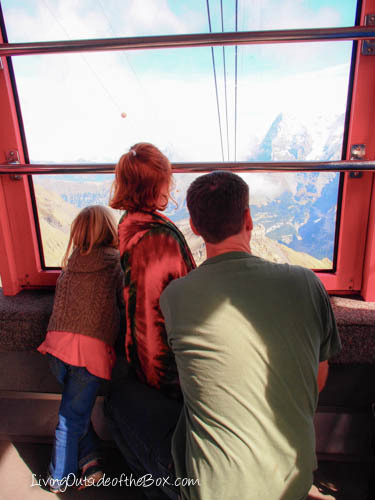 Yea, there is civilization in Switzerland, but the cable cars brings less traffic to the mountain peaks than the roads do in the USA. In Alberta they drive buses on the glaciers; in yellowstone they have benches around the geysers; at the grand canyon, you can take a bus around the whole rim; in Colorado the roads go up to 14,000 ft, etc. It’s industrializing nature at its finest. Honestly, the whole yellowstone experience made me feel like I was at a movie theater. 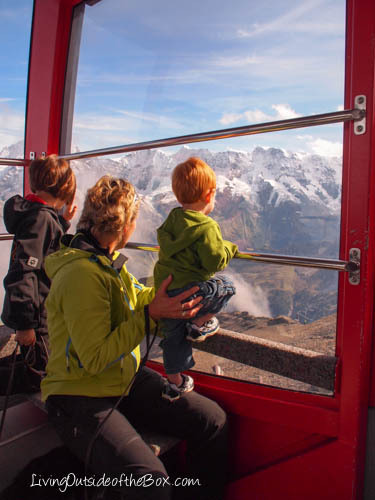 What I appreciate about Switzerland is yes, nature is still accessible for people like you who have small children or people who are elderly, etc., but it’s offered in moderation, not at the expense of tearing up the mountains (or the grand canyon).